These 100% whole wheat chocolate cupcakes are made just a little healthier with less sugar (or honey!) and are incredibly moist. Can also be made with all-purpose or gluten-free flour and they’re naturally dairy-free. I first posted this recipe almost 5 years ago. It’s my favorite chocolate cake or cupcake recipe and it’s ruined almost all other chocolate cake recipes for me. They’re never moist enough. I do love my paleo chocolate cupcakes but they have a totally different texture and they can’t really be compared. I thought I should try making this whole wheat recipe gluten-free so I tried them first with buckwheat. That resulted in some funky weirdness. They tasted… floral. For another delicious cupcake recipe using that flour mix, try these gluten-free vanilla bean cupcakes from Gluten-free Palate! There are two ways you can make these cupcakes when it comes to sweetener: with sugar or with honey. The texture using sugar is mind-blowingly awesome. It’s the moistest chocolate cake ever. Kind of fudgy, even. Pretty much everyone who tastes this cake says it’s the best chocolate cake they’ve ever had. The version with sugar is, in my opinion, tastier than the honey version, but with two cups of sugar, which the original recipes calls for, it’s kind of ridiculous. It also works with 1 1/2 cups sugar (but it’s even yummier with 2 cups!). For another delicious whole wheat and honey recipe, try my whole wheat apple muffins! They’ve always been a big hit. The honey version is almost as good. I used one cup of honey instead of two cups of sugar and it’s pretty awesome. The taste is almost as good as the two cups of sugar version but the texture is like normal chocolate cake, and not like the super duper moist and fudgy original recipe. I’m thinking with the frosting, nobody would even notice. And if you’re wondering if you can taste the whole wheat in these whole wheat chocolate cupcakes – definitely not! I’ve made them dozens of times and when I decided to replace all of the white flour with whole wheat (or whole spelt), nobody noticed. The gluten-free version also tastes the same as the all-purpose flour version. 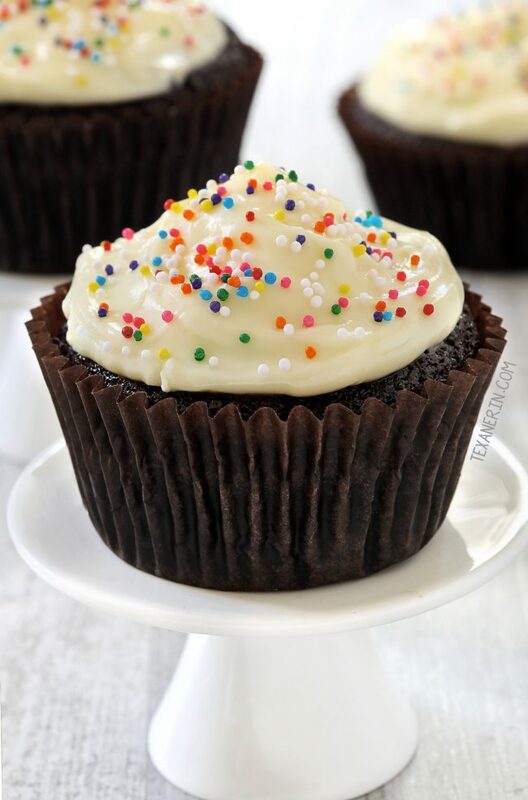 I used this healthier cream cheese frosting to top these cupcakes off but this vegan chocolate fudge frosting would also be great! For some vegan cupcakes, try these vegan gluten-free chocolate cupcakes from Beaming Baker. And if you’re in the mood for something a little more gooey, try this Hot Fudge Pudding Cake from A Family Feast. I’m pretty sure it’d be delicious with whole wheat flour! Preheat your oven to 350 °F (175 °C). Line 2 muffin pans with 24 liners. In a large bowl, stir together the sugar (if using honey, don’t add it yet), flour, cocoa, baking powder, baking soda and salt. Add eggs, milk, honey (if using), olive oil and vanilla. Mix for 2 minutes on medium and then stir in the boiling water. The batter will be almost as thin as water. Fill each liner just a little more than halfway full. Bake for 14 – 18 minutes or until a toothpick comes out with some moist crumbs, but no liquid. If you make the gluten-free version, you'll need closer to 18 minutes. If you make the whole wheat / all-purpose versions, you'll need more like 14-16 minutes. Let cool for 5 minutes in the pans, and then turn out onto a rack to cool. Let cool completely before frosting. I’ve also used 1 1/2 cups sugar and it was still sweet enough. In a separate bowl, using the same beaters, beat the cream cheese until soft and smooth. Slowly add the powdered sugar. Dissolve 1/2 teaspoon of espresso powder in 1/2 teaspoon vanilla (I did this in a tablespoon). Add this to the frosting. If you want more coffee flavor, keep adding 1/2 teaspoon espresso / vanilla until you’re happy. Fold in the whipped cream and frost the cooled cupcakes. Store frosted cupcakes in the refrigerator. 192 comments on “100% Whole Wheat Chocolate Cupcakes (gluten-free, all-purpose options)” — Add one! I tried so many while wheat sugar free muffins, and this was the best, absolutely perfect. Thank you for the recipe dear. But can i substitute cocoa powder for more flour and make it vanilla cake? I’m so happy you liked them! But unfortunately you can’t make this into a vanilla cake. :( The whole recipe would need to be reworked. Sorry about that! I was putting big hopes I can do that :( unfortunately, so do you know another recipe for vanilla cake with whole wheat flour and sugar free, I can use honey or maple syrup as a sweetener. I wanted to ask you if I could use liquid jaggery if I don’t have honey. Thanks for sharing this absolutely delightful recipe. I use the exact same proportions and baked a very chocolaty and moist cake instead for picnic with our friends today. I also added some choco chip and the cake was mind blowing ! The only issue I faced was that my microwave oven wouldn’t set to the exact temperature – it’s either 170 C or 180C, so I kept it at 170 and baked the cake for a total of 55 mins. Hi there! You’re welcome for the recipe. :) I’m so glad that it worked out well at a different temperature and in cake form. And added chocolate chips are always a good idea. :D Thanks for your feedback and my apologies for my very slow reply! I’m so sorry for just now seeing your question! Especially since it was for your mother’s birthday. :( I don’t use erythritol (it gives me gut issues) so I really don’t know. Can you use maple syrup? I think that would work. Sorry that I can’t be more helpful and I’m really very sorry again for my slow reply. I’m not usually this bad! I made these yesterday and they came out so well! Super moist and pretty. Everyone in the house loved it. I couldn’t find baking soda, hence used baking powder 4 times the required amount of baking soda (in total 7.5 teaspoons). Also for the frosting i just used peanut butter mixed with normal butter. Will definitely make these again! I’m happy that they came out well! And that’s an interesting sub. I’m glad that it worked out well! Your frosting sounds delicious. :) Thanks for the tip and for your feedback! I made this for my son today who has food allergies (I used almond milk). I absolutely loved it but he didn’t so much. I think it’s because he’s never tasted chocolate before. If I omit the cocoa powder, will the cake still come out ok? I’m thinking he may like it more of it wasn’t chocolate, but I loved how fluffy and moist this cake was so I don’t want to look for a totally different recipe. I’m sorry for just now seeing your question! I’m happy you enjoyed them. :) Unfortunately, you can’t just omit the cocoa powder from a chocolate cake to make it a vanilla cake. It’d have to be totally reworked. Sorry about that! I wish I had a vanilla cake recipe to recommend but I’ve never found one I really love. Has anyone tried substituting applesauce for the eggs? Or do you have a vegan gluten free cupcake recipe? Sorry for just now seeing your question! I’ve never tried that but I do have a recipe you could use! Check out the base of these football cupcakes. 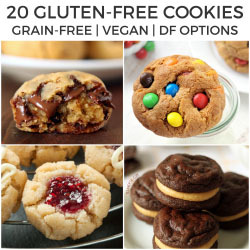 They’re vegan and if you use Bob’s Red Mill 1-to-1 GF Baking Flour, they’re gluten-free, too! That’s how I make them and they’re amazing. Hello!! Can I sub the sugar/honey with Splenda granulated sugar? Thank you! I made it and loved it. Its too much “Splenda” flavor for my girls so I will play around with it and use brown sugar or something else. How would measurements be adjusted for a double layer standard round cake? Also for vegan chocolate frosting recipe? You can use two nine inch round pans and bake for 30-35 minutes. I’m guessing you’d need to double the frosting but haven’t tried it and can’t say for sure. Hey, could I add bananas to this recipe to make a banana chocolate cake? Absolutely great recipe btw, I make it all the time! I’m happy you enjoy it! :) Unfortunately you can’t just add bananas to a recipe without adjusting a bunch of other stuff. But I do have these whole wheat chocolate banana muffins if you want to try those. :) Thanks for your comment! Hi, this recipe sounds great and I plan to try it soon. Could you please clarify-when you say mix for 2 mins, is that using a stand mixer/hand mixer or just whisk by hand? Thanks much ! Hi there! Sorry for the slow reply. Always just mix by hand unless the recipe calls for a hand mixer. :) You don’t want to overbeat the cupcakes, muffin, etc. batter! Hope you’ll enjoy the cupcakes and sorry again for the slow reply. Used this recipe to make one round cake (halved the recipe). Absolutely delicious and by far my best chocolate cake. I reduced the sugar a tad bit and felt the sweetness was just right to eat without frosting. Thank you! Oh my. I have no idea how I just now saw your comment! Sorry about that. I’m very happy to hear that you liked the cake and it’s great that it worked well with less sugar. :) Thanks a bunch for your feedback! In the place where I live now, it’s very hard to get all purpose flour. The only available flour is atta flour (which I have just figured out that it is whole wheat flour). And everything I baked becoming too dense. I almost desperate in baking and I still have 5 kg of this flour! Then I found this recipe. I made this but with 1.5 cups of sugar. My cupcakes could not stand for more than 1 day. Everyone loves it even without frosting. It’s sooo moist and light. I baked it in a cupcake shape, in a loaf shape, in a square pan, in every kind of pan available. I will stick to this recipe. I love that you bake it in every kind of pan! That’s great. :) And I’m happy you finally have something to make with your flour! This whole wheat carrot cake is also a great option. :) Thanks a bunch for your comment! OMG!! I didnt make cupcakes, i did a regular cake in a loaf pan. just put a bit less water and used coconut oil. they are amazing! moist, loft, fluffy. We love it! It is now a go to recipe for sure. Thanks for sharing! Just one of those we make meatloaf in, maybe 3×8 inches. it took a bit longer to cook, i dont usually keep track. if the cake is starting to smell, another 10 min it will be fully cooked. does one cup of honey make the cupcakes too sweet? So happy you all like them! :) I’m in the process of moving and haven’t had internet since Sunday. I just got it on my phone but getting you the links is challenging. Just google “texanerin banana muffins” and you’ll find two options. :) Adding bananas to this recipe would require a lot of reworking. Thanks for your comment! Your recipe sounds fab. Its my moms birthday tomorrow. I wanna do these lovely cupcakes for her. Unfortunately enough she can’t eat eggs. Any substitute you can suggest? Hi Prity! Thanks. :) I haven’t tried any egg subs in these, sorry. I normally use chia eggs but since I haven’t tried them in these, I can’t say for sure if it’d work. Woohoo! So happy that you liked them so much. :) I had no idea what the answer was so I googled it and found this, which has some ideas. Thanks for your feedback! I’ve made these cupcakes several times and they are so good I’ve made them my staple chocolate cupcake recipe. They’re so good I eat them by themselves without frosting. I’ve made batches with less sugar and 1 1/2 c. of sugar are my preferred amount, but 2 c. of sugar isn’t too sweet either. The are really moist and the pourable batter actually makes it easier to handle for me. Easy and delicious. This is the first recipe I’ve made from ou and I look forward to making more. Yay! I’m happy to hear that they’re your staple cupcake recipe and that you’ll be trying more of my recipes. :) I hope you’ll enjoy them just as much as these cupcakes! Thanks for your comment. Thank you Erin for this recipe! I made them for the first time for my little guy’s fifth birthday today. I am doing the honey version. I just took them out of the oven and I am amazed at how they actually rose and baked from such a thin batter!! I have this strong feeling we will be making these again…take care!! You can use two nine inch round pans and bake for 30-35 minutes. :) Or you can halve it and use an 8″x8″. I’m not sure of the baking time. Hope you’ll enjoy it! The cake came out really well and I used honey. Do post more recipes using whole wheat and honey as sweetner. I will definitely make many more of this cake.Want everyone to taste it. No one who had could guess its made of whole wheat and honey! I’m so happy that it was a hit! I also like whole wheat + honey. :) You should try these whole wheat cinnamon apple muffins next! They’re also honey sweetened and super yummy. Love love love these. Used agave nectar. Hi, can I use 1 cup of coffee instead of the water? I want to make this cake for my son’s birthday and want to know if this will rise enough with whole grain whole wheat king Arthur flour? Thank you in advance. Hi there! That would work and should be quite tasty. :) I haven’t tried that specific brand of whole wheat flour in this exact recipe but every other brand I’ve tried works just fine! Thank you so much. I will let you know how it turns out. Sooooooooo yummy and moist! I used King Arthur whole wheat flour, 1 1/2 cups of sugar instead of 2 and added chopped walnuts to my batter. They were delicious!!!!!! Claims that this is the best gluten-free chocolate cake ever are NOT over rated. I have made this recipe several times and each time, the cupcakes are fantastic. For Canadian readers, I use Bulk Barn’s 1:1 gluten free flour mix (in place of Erin’s suggested Bob’s Red Mills) and the results are great. I also freeze any leftover cupcakes 24 hours after baking. The flour I use takes on a faint “beany” under-taste on day 2 that slowly increases as days go by. Freezing prevents this. I think I need to do some baking today. These look delicious, I’ve been craving sweet things lately and this will fit the bill perfectly. I think you do, too. ;) I hope you’ll enjoy them! They should definitely satisfy your sweets craving. Thanks for your comment! I love this idea for a kids’ birthday party! Healthier but not quite the texture of paleo baked goods is perfect for little ones (and adults alike)! YUM! Thanks! I bet little ones would like my paleo cupcakes, too. ;) But it’s hard to compete with wheat! YUM!! I love using whole wheat and spelt. You are right the weight measurements can make a difference. When I tested those recipes for your cookbook I did one by cups. I had ground my own wheat and it was so light and airy it was not enough flour. It didn’t turn out so good. Then I weighed the flour and it was a big difference. Might not have been so much had I not just ground my own instead of using store-bought. Made these for a family bbq on Saturday and finished them off on Wednesday and they were JUST as moist and delicious. Can’t wait to try some of your other recipes! Wow, they lasted a long time. :) That’s great. And I’m happy they were enjoyed at the BBQ! Thanks for your comment. The best chocolate cake I have ever baked. Moist, rich, and full of goodness. Yay! I’m so happy you liked it. Thanks for your comment! Best recipe ever!! I used water instead of milk and a tad less sugar. Sooooo good. I made a quadruple batch and it was GONE in 2 days. Thank you! Woohoo! I’m so happy that you liked them. :) Thanks for your comment! Amazing texture and totally loved it..thanks for a recipe. Awesome! I’m happy they came out well. Thanks for your feedback! That unfortunately won’t work. You really need cocoa powder for this recipe! Sorry about that. Hi Erin, out of curiosity,,,will the eggs not get scrambled in boiling water? Thanks for the recipe. I made the cupcakes this afternoon and they turned out delicious! I grow some chocolate mint in my backyard so I decided to sprinkle some shredded leaves in the batter (yum!). I didn’t make the frosting, but sprinkled some chocolate chips on top. Double yum! This one is a keeper. Thanks again! Hi Yany! I’d love to try these with chocolate mint. That sounds delicious. :) Thanks for the tip and for your comment! I’m so happy that you enjoyed them. And my apologies for the slow reply! I just got back from vacation and wasn’t able to access the page from my laptop where I approve and reply to comments. Sorry again! 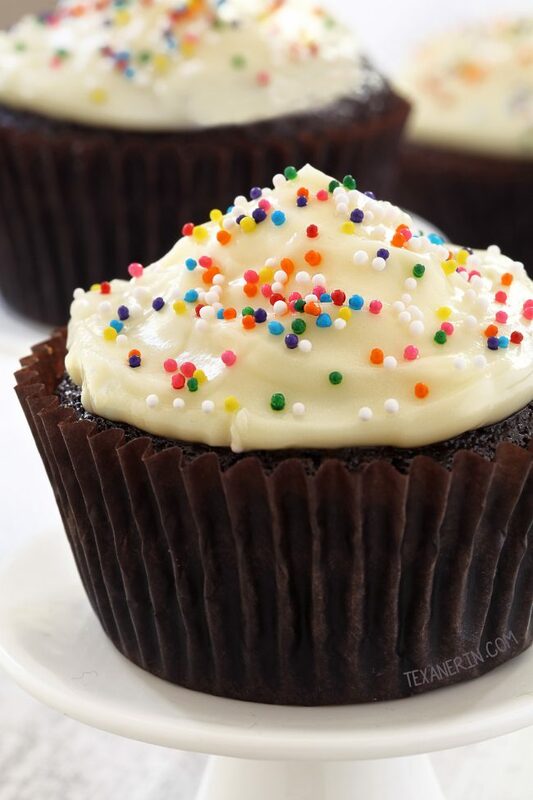 This is my favorite chocolate cupcake recipe!! Could it be made it into a cake? I did see that! I made this recipe in a 13×9 and baked it for 30 minutes. I used my KoMo to mill fresh white wheat! Turned out great, just like the cupcakes. Made these and they are the most delicious thing i have ever baked in my whole life! For the cupcakes I used whole grain spelt for the flour, 1 cup of maple syrup in place of the sugar, cacao instead of cocoa and for the frosting i used 1/3 cup maple syrup instead of the sugar, doubled the vanilla and omitted the coffee powder. So easy to make. Wow! I’m thrilled that you enjoyed them so much and I love your healthy subs. :) Especially the switch to maple syrup! I’ll have to try that next time. Thanks a bunch for your feedback! Absolutely delicious (cooked and raw! – couldn’t keep my fingers out of the bowl!) I made it with 1/2 cup coconut sugar, 1/2 cup white sugar and 1/2 cup agave nectar. Also I used Chapati flour and it turned out amazing! Will definitely make this again as I doubt the 24 cupcakes and 6 Madeleines will last too long in my house. I found this recipe last week and have already made two halved batches of the cupcakes using sugar(not the icing-I went for chocolate on chocolate). Absolutely delicious. Thank you! I’m so happy you enjoyed them! 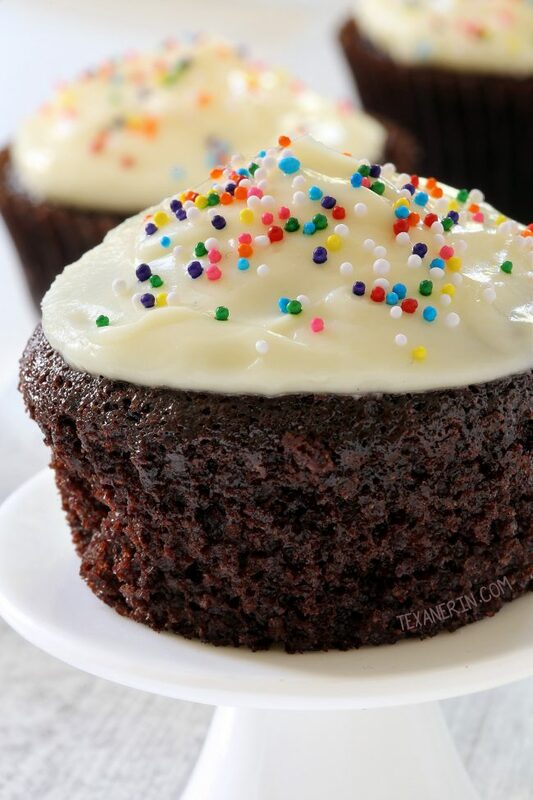 You can never go wrong with chocolate frosting on cupcakes. ;) Thanks for your feedback! The cupcakes were moist. The batter was runny looking but it all worked out. I did not use the icing either. I substituted honey for sugar. I might add more honey next time. It’s supposed to be runny, almost like water, so the batter was fine. :) I’m happy you enjoyed the cupcakes! Thanks for your feedback. 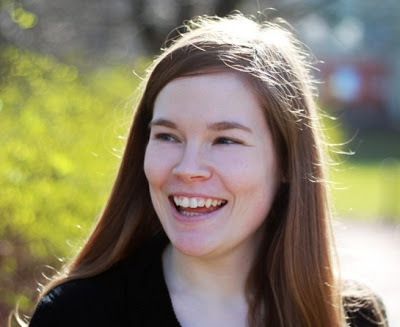 Erin, you struck gold! …And now so have I. I thought I would never be able to fully enjoy another chocolate cupcake without stressing over the processed and refined ingredients within. I made your cupcakes (the honey version) exactly as instructed and they came out perfectly! They were moist, springy, and heavenly. Not sure where people are getting the sticky outcome from. My cupcakes did sort of glisten, but were by no means sticky. I used 100% whole wheat pastry flour and I only had to bake for 14 minutes. I used extra virgin olive oil, though I was really tempted to use coconut oil instead (especially since someone else used it successfully), however I try not to steer away from a recipe the first time I make it ESPECIALLY when it comes to baking. Great recipe! This is definitely a keeper! Oh, I forgot to mention that I did not make the icing. It had a couple of ingredients in it I was not comfortable with (i.e. cream cheese and powdered sugar). I will keep searching for an icing recipe, however these were great without any icing. I don’t like the powdered sugar, either. :( But I’m with you – I like these even without the icing! I think only one person mentioned the sticky thing and I kind of know what they mean. They’re not sticky really but ultra moist and like you said, they glisten. :) And that’s awesome that you like to follow the recipe the first time you make it! Most of my readers seem really good about that but I read so many comments on other blogs saying that they changed every other ingredient and the end product was the worst XYZ they’d ever had. I wonder why. ;) Thanks a ton for your feedback! I’m so happy that you enjoyed them. Thank you! It’s good to know that the options are appreciated. :) I’m so happy that these came out well for you. Thanks a ton for your feedback and I hope you had a great birthday! That was the wonderful cake it turned out to be. Thanks for giving a healthy bite. one question though. It is little sticky.. is it supposed to be like that? otherwise it was just awesome. A little stick sounds about right. You could bake it a little longer to see if that makes it less sticky! Thanks for your feedback. So happy you liked the recipe! I made it again and this time it was perfect ? . Just wanted to know one more thing , can we make vanilla cupcake also with wheat flour ? If yes then plz let me know the ratio of all ingredients.